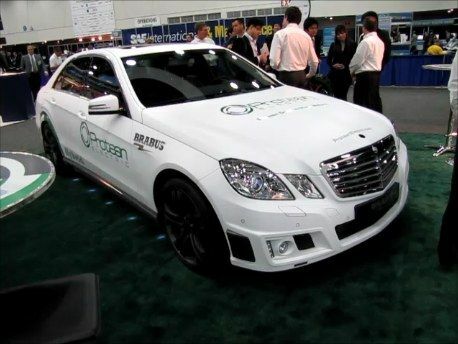 Protean Electric, the global leader in electric in-wheel motors, unveiled its award-winning Protean Drive™ system in a BRABUS Hybrid at the SAE 2012 World Congress April 24-26 at Cobo Center. While the event marked the BRABUS Hybrid's premier North American appearance, fact is, Protean is no newcomer to SAE World Congress. This reporter has covered this in-wheel motor technology on many occasions. This time, though, the appearance is not a truck but a passenger vehicle. Another fact is, BRABUS is a highly acclaimed independent automobile tuner; and the company chose Protean's electric in-wheel motors to power its "Technology Project Hybrid" based on the Mercedes-Benz E-Class. The BRABUS Hybrid vehicle is equipped with two Protean Drive (tm) wheel motors, which power the rear wheels, along with the vehicle's clean diesel engine. Furthermore, BRABUS is known throughout the automotive sector for its discerning use of the finest technology to perfect the performance of its exclusive vehicles. The BRABUS Hybrid and Protean Drive(tm) offer elite automotive customers a practical, environmentally respectful solution without sacrificing performance and power. The news release stated Protean Drive™ is the most advanced in-wheel electric drive system for hybrid, plug-in hybrid and battery electric vehicles. It’s hard to argue with that position. Going well beyond performance, Protean Drive™ can improve fuel economy by up to 30 percent in a plug-in hybrid application. Each Protean motor adds 80 kW (110 hp) and 800 Nm (590 ft-lbs) of peak torque, which, when combined with the 2.2-liter common-rail turbo-diesel engine, give the BRABUS Hybrid an acceleration of 0-100 km/hr (0-62 mph) in 7.4 seconds and 60-120 km/hr (37-75 mph) of 5.6 seconds. "We're pleased to work with BRABUS to demonstrate what Protean's in-wheel electric drive can deliver to the world," Protean CEO Bob Purcell said. "Our in-wheel motors not only provide significant performance improvement, but do so in a very responsible way." Protean Electric is scheduled to present its own findings, Paper Number 2012-01-1037, "Integrating In-Wheel Motors into Vehicles - Real World Experiences" at 8 a.m. April 25, in room 02-33 at Cobo Center. For the record, Protean is funded by Oak Investment Partners, a multistage venture capital firm and a lead investor in the next generation of enduring growth companies. This supports an important point that venture capital is making great strides in green, more efficient transportation. Aside from electrification and hybrids, some of this is making its way, mostly from private investors into the hands of engine developers. This story about Brabus hybrid is updated on May 18, 2018.